What was initially thought to be a protest against the Prime Minister in Leeds today turned out to be the simple case of a ‘jogger running into a pedestrian’ according to official reports. The Prime Minister was leaving the City’s Civic Hall when he collided with the ‘exercise enthusiast’, who was not wearing trainers or any other sports clothing, was quickly jumped on by the Prime Minister’s security team. Mr Cameron did not fall over and was driven away from the scene, apparently uninjured, according to the BBC. 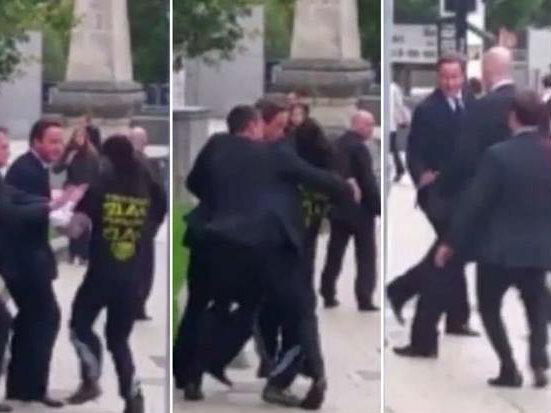 Eyewitnesses say that the Prime Minister noticed the dreadlocked man running towards him before his security team did. Police took the 28-year-old man away. He was arrested but later released. Chief Inspector Derek Hughes said: ”Around midday today, a 28-year-old local man was briefly arrested after he came close to the Prime Minster’s group, who had just left the Civic Hall in Leeds. Mr Cameron was in Leeds today as the government announced plans for ‘HS3’ – a high speed rail network which politicians hope will regenerate towns and cities in the North where both the Conservatives and Liberal Democrats are doing particularly badly in elections. While the incident is being sold as a case of ‘wrong time, wrong place’ it does raise questions about the safety of politicians who, in the wake of claims they are ‘out of touch’ have been keen to be seen out on the ground. There may also be questions raised about the actions of the security team: six men who, according to video footage of the incident, appear to all move towards the ‘assailant’ leaving the Prime Minister himself unattended. Tory MP Mark Pritchard has called on the Metropolitan Police Commissioner Sir Bernard Hogan-Howe to launch an immediate internal inquiry. “The Met Police have some of the best close protection officers in the world. However, this was a clear breach of security and could have been far more sinister in outcome. “With the terror threat level increased, this cannot be allowed to happen again. The Met Commissioner should call an immediate and swift internal inquiry to discover why this happened and implement the necessary lessons learned as quickly as possible. UKIP Leader Nigel Farage was hit on the head with a placard by animal rights and far left activists earlier this year in Ramsgate and during the European Election campaign was hit with an egg when meeting voters in Nottingham. Then Deputy Prime Minister John Prescott famously punched a farm worker who threw an egg at him whilst on the campaign trail. A security expert told Breitbart London that the incident showed how vulnerable all politicians were.